I scream, you scream, we all scream for ice cream. Ice Cream, the other white meat. Especially when it's free, which happens to be the case tomorrow at Bleacher Bar. No Catch, No Rules, No Coupon... Just Free Fun! Invite your friends, family, coworkers, roomates, cousins, neighbors, whoever, all are welcome! 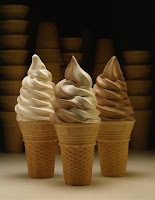 Stop by the Bleacher Bar Take Out Window anytime between 4p-7p to get your FREE soft serve! There you have it folks. Free ice cream. 1 Response to "Free Soft Serve @ Bleacher Bar - 5/29"
Sounds great. But if, like me, you have no idea where Bleacher Bar is (I'm guessing Fenway? ), get out your Google 'cause this post won't tell you.